Cannabis: Israel's next big medical export? Israel's fast-growing cannabis industry has high hopes for a new market -- exports of medical marijuana to America. The country is already a leading supplier of pharmaceuticals to the U.S. Now its government, scientists and companies are working together to turn the once illicit drug into a booming new medical business. With conservative Rabbis giving the okay for medical marijuana use, and the government adopting a relaxed stance, investment in cannabis production has exploded. The industry is being pushed by Israel's Ministry of Health, which is trying to take the morality out of weed. "I'm not sure that my people, my voters are so [happy] about what I did," Health Minister and ultra-orthodox Rabbi Yaakov Litzman told CNN. "If I have to look strictly at how I can help sick people who need this cannabis, I think I did the right thing." The number of people in Israel being treated with cannabis has soared from a few dozen 10 years ago to about 23,000 in 2015. Cannabis producers expect that growth to continue. 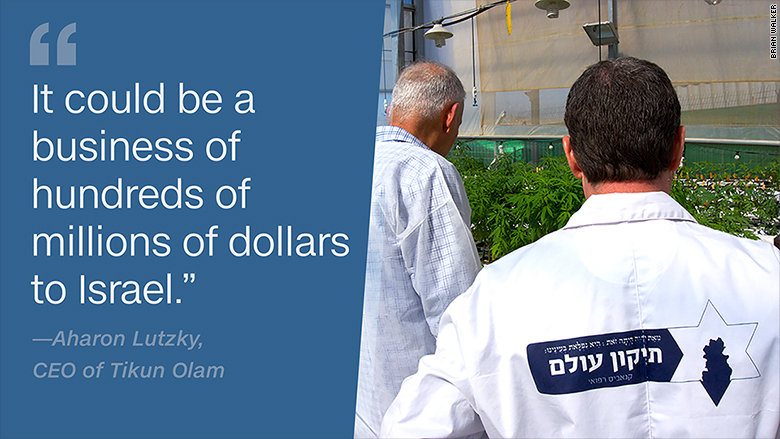 "It could be a business of hundreds of millions of dollars to Israel," predicts Aharon Lutzky, CEO of medical cannabis supplier Tikun Olam. That's still tiny compared to the size of the U.S. market for legal cannabis, which could be worth $22 billion by the end of the decade, according to industry data analysts New Frontier. Israel allows companies to export their knowledge, but not marijuana or its extracts, although Lutzky and others expect the law will be changed soon to allow shipments. 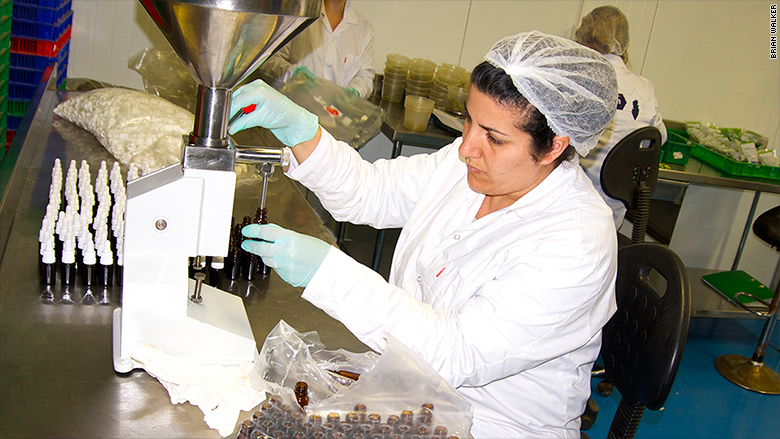 Tikun Olam, which means "Healing the World" in Hebrew, is hoping to capitalize on its know how overseas by getting patents on its best strains, and by entering joint ventures with other firms. It has already established greenhouses in Canada with MedReleaf, and says it has three agreements for similar investments in the U.S. The company claims to have developed a cannabis strain with the highest level of THC ever grown. THC is the chemical responsible for the drug's high -- it's also good for relieving severe pain. Another plant the company has developed has virtually none of the psychoactive chemical but the highest CBD level currently in cultivation. CBD is a cannabinoid that may have a number of medical benefits. That could open up new markets for children, or professionals who need treatment but can't spend the day in a mental haze. Tikun Olam is also trying to produce personalized therapies. "The real thing holding back the industry is the problem of how to make a standardized level of product from a plant where so many factors are based in nature," said Scott Levenson, COO of Tikun Olam. To help maintain standards, the company's labs and greenhouses are strictly controlled to make sure there is no cross-pollination. Levels of cannabinoids are measured precisely and plants are bar-coded and tracked closely from planting to harvest. Cannabis is not considered a restricted food in Judaism, therefore it does not carry a kosher certification. The Jewish religion permits ingestion of anything natural that helps people stay healthy, and medical cannabis has been accepted even by religious conservatives. But it has its critics in Israel, and regulations make cannabis research difficult. Still, experts say the country is well placed to exploit the potential of medical marijuana, partly because of tighter controls on the industry in the U.S.
"Israel is right on the cusp of being able to grab hold of this entire industry and become the real mecca for marijuana research," says Suzanne Sisley, physician, Internal Medicine/Psychiatry at the Arizona Telemedicine Program.